That underdog mentality has fueled the occasionally prickly Patterson for much of his career, but TCU isn’t the underdog at the moment: On the heels of a 12-1 season, the Frogs are ranked no. 2 in the preseason AP poll, signaling their return to prominence after a bumpy beginning to their Big 12 tenure. While last season’s resurgence was triggered in large part by the offense’s transformation into an Air Raid–infused powerhouse following Doug Meacham’s and Sonny Cumbie’s appointments as co–offensive coordinators and Trevone Boykin’s emergence at quarterback, the constant throughout Patterson’s 14-year head-coaching tenure has been his defense. The Frogs have led the nation in total defense four times under Patterson, and his defense was again championship-caliber in 2014, when TCU gave up the fewest rushing yards per play and tied for the most interceptions nationally. The Frogs also led the Big 12 in nearly every meaningful defensive category last year, including scoring defense, total defense, and pass efficiency defense. TCU embarks on the 2015 campaign with a real shot at making the College Football Playoff and competing for the national title, but NFL and college coaches alike have their eyes on the Frogs for more fundamental reasons: Patterson’s masterwork is a morphing, multifarious 4-2-5 defense featuring five defensive backs and only two linebackers, and it’s uniquely designed to slow, and ideally stop, the offenses that have been bombarding defenses with a combination of spread formations, option (and run/pass option) football, and a frenzied no-huddle pace. “I don’t think there’s any question about the fact that it’s more difficult to play defense,” Alabama coach Nick Saban said at SEC media days. “I think that’s why you see more points being scored, and I don’t think that trend’s going to change any time soon.” While other great coaches have been overhauling their defenses, however, Patterson has continued to rely on the 4-2-5 he developed precisely to combat the kinds of wide-open attacks now dominating football. Before one can understand why Patterson’s design might be the antidote to the problems posed by modern offenses, though, one first has to understand how his defense is built. Patterson’s 4-2-5, however, was designed with those challenges in mind. By playing five defensive backs, Patterson almost never needs to substitute to match up with the offense. But the system’s genius runs even deeper: Patterson has cleaved the very structure of his defense into pieces, simultaneously making everything simpler for his players and more complicated for opponents. In addition to divorcing the fronts from the coverages, Patterson goes even further by splitting his secondary down the middle. “The coverage is what we call a double-quarterback system,” said Patterson at the 2011 clinic. “We play with three safeties on the field. We have a strong, weak, and a free safety. The free and weak safeties are going to control the halves of the field. They are the quarterbacks and they make all the calls.” In short, TCU typically calls three different defenses on every play: a front call for the linebackers and defensive linemen and different coverages for each side of the backfield. Just because Patterson breaks his defense into bite-size morsels doesn’t mean it’s unsophisticated, however. Far from it, particularly when it comes to Patterson’s unique pass coverages, which mutate from man to zone and back again, sometimes on the same play. 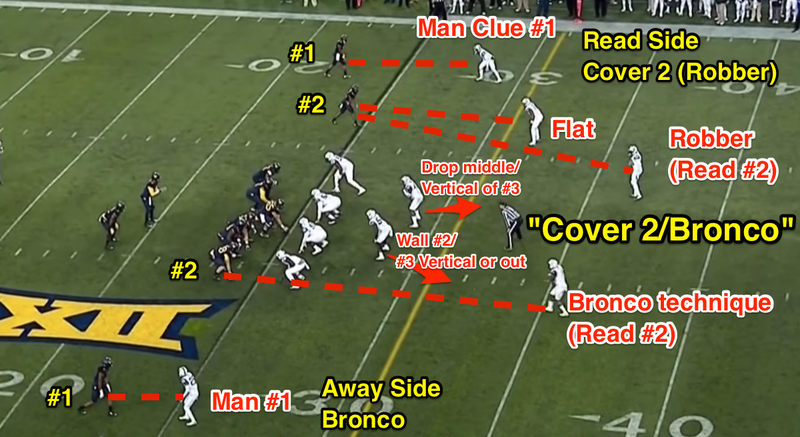 In recent years, Patterson has also added a hybrid man/zone concept called Bronco, in which the corner plays man on the no. 1 receiver and the safety plays man on the no. 2 on any vertical or outside-breaking route, but if the no. 2 receiver runs inside on a slant or short crossing route, the safety lets him go and becomes a Robber. Bronco allows TCU to keep its linebackers in the box to stop the run even if the offense is in a spread formation. Finally, Patterson also features an extensive man-to-man blitz package that allows him to call essentially any blitz or stunt at any time. Just because Patterson’s defenders are reading the offense doesn’t mean they’re passive, though. “Where we are different from other teams is our rule for our safeties: ‘Don’t go till you know,’” Patterson said at a 2015 clinic. “Other teams have their safeties backpedal, but we sit there and flat-foot shuffle. We want you to try to throw vertical. I was a front coach for many years before I became a secondary coach. There is nothing worse than a secondary coach who is always worried about getting beat deep. We want to take away the short game, we want to take away combination routes, and we want to stop the run.” TCU’s defense does all three. This deep scouting extended beyond general offense: Ole Miss coach Hugh Freeze has a reputation for calling trick plays at opportune times, but Patterson discovered another tell. “Before the bowl game against Ole Miss, we told the defense that if a receiver or back lined up wide and deeper than five yards, be on alert. They were going to run a trick play of some type: a reverse, counter, screen, double pass — something crazy was about to happen.” Patterson was right — and his defense would not be fooled. Patterson’s defenses have made short work of essentially every offense they’ve faced over the past decade or so, with one glaring exception: in-state rival Baylor, now a conference foe. Baylor has torched TCU’s defense a few times in the past few years, including Robert Griffin III’s 359-yard, five-touchdown coming-out party in the 2011 season opener, and last season’s come-from-behind 61-58 Baylor victory, in which the Bears racked up 782 yards of offense in overcoming a 21-point fourth-quarter deficit. Baylor’s offense certainly presents TCU with a number of challenges, particularly given how effectively the Bears get their ultra-speedy slot receivers matched against TCU’s safeties on deep shots, which in turn opens up the Bears’ inside runs. If Patterson’s philosophy is to force his opponents to throw deep, Art Briles’s Bears have been only too happy to oblige. Baylor has boasted arguably the best offense in the country over the past four or five years, averaging 600 yards of offense per game over the past two years in particular. Yet if you study the games in which the Bears have been limited, TCU shows up on the opposing sideline more than any other team. In 2013, TCU held Baylor to roughly half its season average in yards per play, and in 2012 the Horned Frogs snagged four interceptions en route to a 49-21 win. That’s not a knock on Baylor’s modus operandi, but a reminder that the evidence is mixed — and that the November 27 matchup between TCU and Baylor, which ranks no. 4 in the preseason AP poll, looms large. Since Patterson arrived at TCU, he’s found an awful lot of answers to an awful lot of offenses, causing coaches at every level to look to TCU to see how Patterson is trying to solve the riddles posed by today’s schemes. Time will tell whether his defense will continue to stay ahead of offenses, but right now, Patterson’s distilled defense, fluid pass coverages, and uncanny game planning and play calling are as good as any coach’s in football. Not bad for a coach who took the low road. This is increasingly the case in the NFL, too. On each play, TCU’s secondary declares a “Read Side” and an “Away Side,” with the Read Side being the side of the offense’s passing strength. 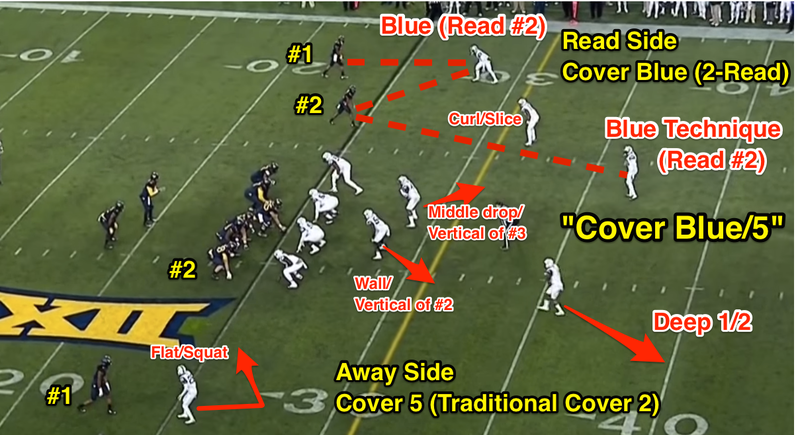 Specific rules for Cover 2 “Robber” coverage: (1) Cornerback: Play man coverage on the no. 1 receiver on anything vertical. (2) Free safety: If the no. 2 receiver is vertical, play him man-to-man. If the no. 2 runs short inside or outside, rob curl-to-post. (3) Strong safety: Wall off the no. 2 receiver on his release; if he runs to the flat, pick him up. Specific rules for Blue (2-Read/Palms): (1) Cornerback: If the no. 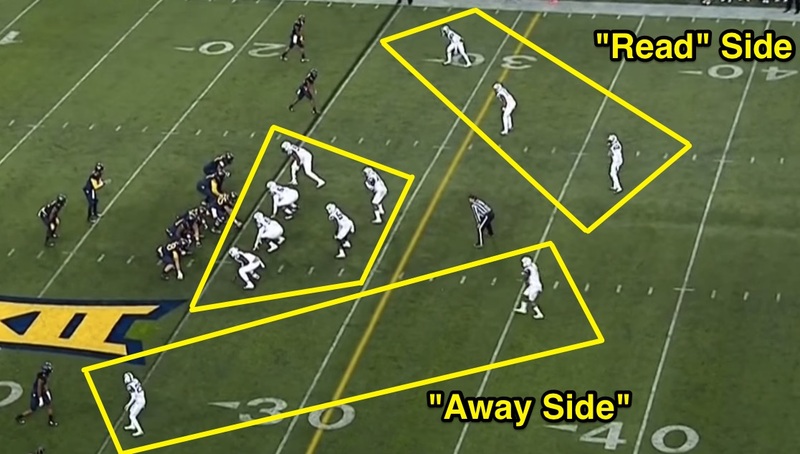 2 receiver is vertical or inside, play man coverage on the no. 1. If the no. 2 runs to the flat, pass the no. 1 off to the free safety. (2) Free safety: If the no. 2 is vertical, play him in man coverage. If the no. 2 runs to the flat, get over the top of the no. 1 receiver. (3) Near linebacker/safety: Wall off any quick in-breaking routes by the no. 1 or 2 receivers; drop to the curl.